September 11, 2018  This week's essential mix has music from Thom Yorke's first-ever film score, a pulsing cover of Califone's "Funeral Singers" from Sylvan Esso, obliterated guitar rock from Squirrel Flower and more. August 9, 2018  The vocal trio's members have kept busy with other projects, including Amelia Meath's star turn in Sylvan Esso. 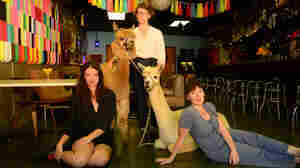 Now, you can hear three songs from Magic Ship, out Sept. 21. June 21, 2018  Sylvan Esso's live performance is where it's at. 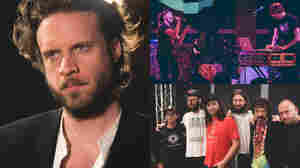 Anyone who has seen the duo perform is immediately engrossed by their indomitable energy and raw, idiosyncratic style. January 23, 2018  This week's mix of essential new music includes the mind-bending sounds of pianist Nils Frahm, Sylvan Esso's electro-pop romp for the end of the world, the gorgeous harmonies of Darlingside and more. January 17, 2018  As Amelia Meath highlights images of a wrecked planet, producer Nick Sanborn sets her words to an arrangement so playfully springy, it can't help but sound like summer fun. 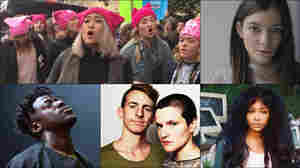 December 11, 2017  Ann Powers and Stephen Thompson join hosts Bob Boilen and Robin Hilton to look back at the highlights of 2017 in music, from the women's march on Washington to Kendrick Lamar's DAMN. and more. 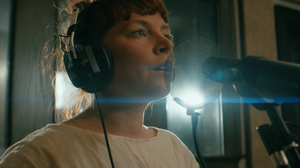 July 28, 2017  See the complete studio sessions for the electronic duo's latest project, a collection of Sylvan Esso songs performed by a full band, with saxophone, electric guitar, piano and more. 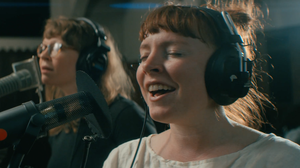 July 28, 2017  Sylvan Esso perform "Radio" with a big band of friends in the duo's final installment of the Echo Mountain Sessions. 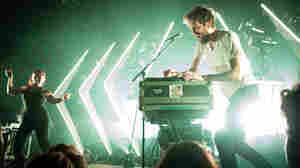 July 27, 2017  Watch Sylvan Esso playfully perform a big, blasting version of the the duo's song "The Glow," with a band of sax, guitars, drums and more. 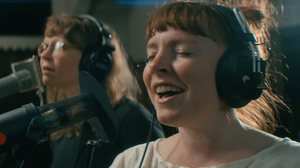 July 26, 2017  Watch Sylvan Esso perform a spare and beautiful version of the the duo's song "Slack Jaw," with Jenn Wasner of the bands Wye Oak and Flock Of Dimes. 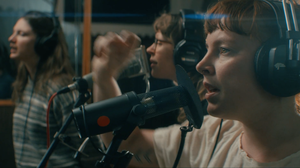 July 25, 2017  Watch Sylvan Esso perform a version of the the duo's song "Die Young" with members of Wye Oak, The Mountain Goats, Hiss Golden Messenger, Mountain Men and Megafaun. July 24, 2017  For one day only, members of Wye Oak, The Mountain Goats, Hiss Golden Messenger, Mountain Man and Megafaun joined Sylvan Esso to reimagine and record the electronic duo's music as a full band. May 4, 2017  The dynamic duo's follow-up to its hugely successful debut features one of its best songs yet, which Amelia Meath and Nick Sanborn performed live for KCRW. April 28, 2017  Sylvan Esso singer and lyricist Amelia Meath shares the stories, joy and dreams behind each track of the band's new album, What Now. 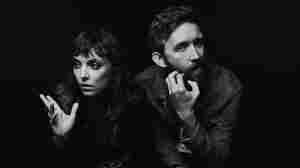 April 27, 2017  Once Amelia Meath and Nick Sanborn became famous as Sylvan Esso, they immediately felt the burdens of replicating their success. 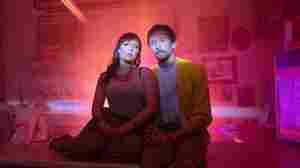 Three years after their electro-pop debut, they're back with What Now. March 29, 2017  Hear songs from the duo's forthcoming release, What Now, recorded live for World Cafe's 25th anniversary celebration.